Here’s the deal: The United States has historically contributed the most to global warming, and over the past eight years it’s done the least to stop it. In fact, the U.S. has actively tried to block progress on a global climate deal. Whoever takes office as U.S. President next year has a lot of work to get the US back in the game–and their very first test on climate change will come even before either Obama or McCain takes office. That test will be the next UN Climate meeting coming up in December. IF the next president goes and makes a strong statement about the U.S. rising to the challenge of the climate crisis, it could dramatically alter the course of the negotiations. But McCain and Obama will only go if they’re invited. That’s where we come in. It’s crucial that citizens from around the globe put pressure on Obama and McCain to ensure they attend the meeting, and play their part in getting the U.S. to be a leader on global warming. It is important that ALL OF US invite Sen. Obama/Sen. McCain for this to happen. 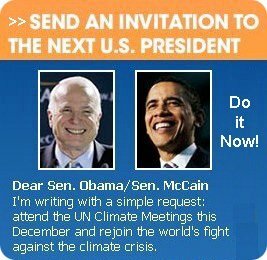 Please visit www.350.org/invite to send your personal invitation to McCain and Obama today.